But I certify you, brethren, that the gospel which was preached of me is not after man. For I neither received it of man, neither was I taught it, but by the revelation of Jesus Christ (Galatians 1:11-12). We have just heard these remarkable words, addressed by the Apostle Paul to the ancient Galatians and, through them, to the entire world. They confirm the great truth that the Gospel is not the fruit of human wisdom: the Gospel is Divine Revelation, that is, the word of God Himself. Today we are celebrating the memory of the Holy Prince Vladimir, the Baptizer of Rus’ and Equal-to-the-Apostles. It is not by chance that the Church offers us these apostolic words on the feast days of men and women who are Equal-to-the-Apostles. The Holy Prince Vladimir showed the truth of these words by his life. 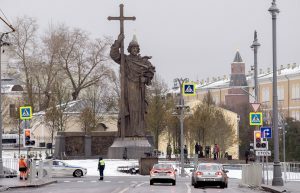 Who was Vladimir prior to his Baptism? A lascivious and cruel ruler. He was responsible for the deaths of many innocent people. The thirst for power, money, and pleasure was his main purpose in life, as it was of other rulers of his time. That is why wars were waged and lands were seized: to have more power and greater opportunity to rule others. But what happened after Prince Vladimir was immersed in the baptismal waters? His life changed. He did not become a more cruel, evil, lascivious ruler; instead, he became a ruler whom them people, in tenderness and joy of heart, called the Red [Beautiful] Sun. What happened to this person? Why did he go from the clear and comprehensible goals and values he had professed as ruler to other goals and life values? Because through Baptism he accepted Christ in his mind and heart; along with Baptism he accepted a new value system that differed radically from that with which he had lived, in which he had believed, and for which he had previously fought. But what lies at the foundation of this value system to which he gave his mind, soul, and life – and which he desired the whole people to follow him in embracing? It is the word of the Gospel. At the heart of this word is something that people still have a difficult time understanding, something that never ceases to amaze each succeeding generation of people by its novel and compelling power. At the heart of the Gospel message is a single and crucial word: love. Love as the foundation of existence, love as the foundation of personal and family life, and love as the foundation of social and even political life. These words remain incomprehensible to many; power, money, and strength are much more understandable. Under these objectives one can impose any political program or inspire people to fight and even go to war – for the demon of desire to become rich, powerful, and strong lives in us all. But what is this love that Christ preaches? How can one love one’s neighbor? How can one love even one’s enemy? This is a question that we, who are already believers, ask ourselves since we recognize that there is no love in our hearts for others, let alone for our enemies. What do these words of the Lord mean? For these are not human words; they are not the wisdom of generations, peoples, or all humanity. This is Divine wisdom. Whether people understand it or not, whether people are capable of heeding this wisdom or not, the word of God never ceases to be the word of God and to be Divine, eternal, and unchanging truth. The strength of the believing person is that, even if he does not fully realize this Divine truth in his mind or experience of life, he still bows down before it in mind and heart in obedience to the word of God. 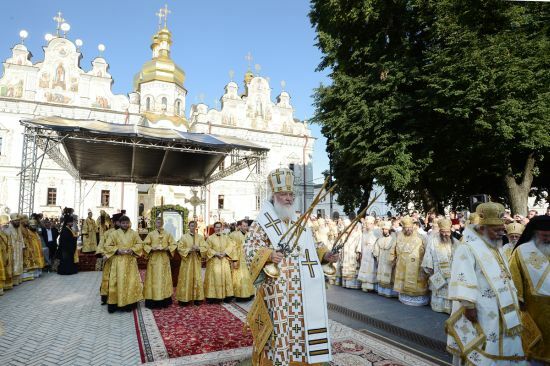 Patriarch Kirill officiating at the Vigil for St. Vladimir, Kiev Caves Lavra, 2012. Divine truth becomes understandable through our inner, religious experience; this experience helps us to understand what God has accomplished in Christ, His Son, for our salvation. The Lord came and suffered so that we might have life and… and have it more abundantly, as we have just heard in the Gospel according to John (10:10); so that the fullness of human existence might not end with death, but carry over into eternity. It was for this reason that the Lord came and gave Himself, gave His life, over to the mockery of human malice, envy, anger, and impurity. He did this, moved by His love for people and His creation. Through the example of the Lord Himself we can understand what love is: love is first and foremost the ability to give of ourselves to others. The willingness to give of ourselves – to give a part of our life, time, effort, money, human warmth, and concern for others – is a manifestation of love. These are not just pretty words, but the ability to share one’s life with others. It was pleasing to God that precisely this human ability to share one’s life with others might serve as the foundation of human existence and of the most important law by which personal, family, and social life should alone be structured. Each of us knows by experience what this is. When is a family strong? When the husband gives of himself to his wife and family, and the wife gives of herself to her husband and children. Just try to stop giving of yourself to others – and your family will immediately feel a terrible and cold gush of wind. Trust vanishes and suspicion appears: “Why did he or she act that way? What’s behind this? Perhaps he or she doesn’t love me anymore?” We know how families fall apart simply because the spouses cease giving of themselves to each other, caring for each other, taking on the other’s life as their own. Does not the problem between fathers and children, and between generations, lie in this? It grows out of understatement, out of parental love not being fully expressed, and out of parents not receiving love from their children. Continuity is broken, as is the historical link between generations. What happens in societies when the law of love is lost, when the struggle for one’s own personal interests – political, economic, national, class, societal – begins and these interests and values become paramount? It is not a struggle for life, but for death. The fabric of human fellowship is destroyed: where there should have been mutual support, love, solidarity, and harmony there appear human chaos and confusion under the slogan of building a happy life. The troubles and divisions of our people always sprang from slogans calling us to a happy life. Was not our people bathed in blood when, in the terrible years of the revolution, they were seduced by these slogans, coming to believe that it was possible to build a happy, prosperous, and peaceful life without God and without love? Millions of people perished, and the dream was not realized. It was hindered from realization because at the foundation of this political dream were malice, confrontation, and the desire to achieve its goals through duping the people with appeals to happiness. The Church is called to be a place where people can gain experience of love and unity. Where there is division, there is no love. How hypocritical and horrible it is when division occurs in the Church in the name of certain “higher” ends! This division manifests the most horrible thing there can be in the life of a Christian: the lack of love. What kind of preaching of love can there be, where is Christ, if human malice destroys the foundation of human existence and tramples upon love for the sake of personal interests – the goals and objectives of which are, in the end, of this world? This is a perversion of the Christian message and a rejection of the Gospel, which is not human revelation, but Divine revelation. This is a rejection of the Gospel with its eternal value system, so distant from our vain aspirations. The Church proclaims to those near and far, to the entire world: there is no other path for the development of peace and human civilization, or of any human society, but the law of love and the solidarity that arises out of love, mutual support, and peace and harmony. We have been taught all this from the Kievan baptismal font and from the Holy Prince Vladimir. 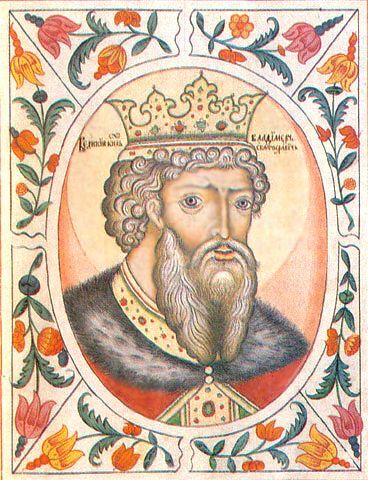 Here, on the banks of the Dnieper, in the ancient walls of the Kiev-Caves Lavra, the image of the Great Prince appears before our minds with specially clarity and strength. Emerging from the baptismal font, he cast aside not only physical blindness, but also the blindness of his soul. He beheld the mystery of human existence and happiness, renouncing all cruelty, love of power, and everything that had until recently warmed his soul and inspired his actions. In that moment Prince Vladimir reconsidered his entire life and gave us the great commandment of love and unity. Within these walls we experience especially strongly the significance of the Holy Prince Vladimir’s commandment of unity of the Church and life according to the law of love. 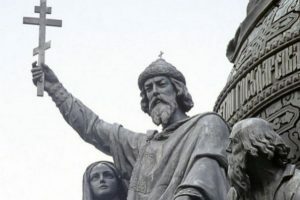 We will pray to the Holy Prince Vladimir, Equal-to-the-Apostles, that he might grant us the strength to love our neighbors: husband, wife, brother, sister, children, and co-workers. May he grant us the strength to love our enemies and to show through our lives that the ideal of Holy Russia is not a face distorted by anger preaching one or another human truth, but rather the meek countenance of Prince Vladimir of Kiev as he emerges from the baptismal font. This idea is invincible and insurmountable, for it is the word of God and not man. Amen. Delivered in the Kiev-Caves Lavra on the feast day of St. Vladimir, 2009.